I don’t know about you, but I always look forward to the mail arriving, always hoping for that surprise check. Or even a letter. When’s the last time you got a real letter? I saw this online yesterday. Less than half of last month’s, less than a third of the highest summer bill. Yay! Postal Service Holiday Mailing Guide-which reminds I want to go through the Christmas stuff and find the ornaments I made over the years and send some to the kids. Been meaning to do that for only years. Reminder post card from Youngtown Car Care-to get our oil changed. I love that place-for a garage that is. Last time I needed car service the owner’s wife took me home after I dropped the car off, then picked me up to bring it back home because we only have one car. And it was only a $40 job. Gotta love customer service like that! L.L. 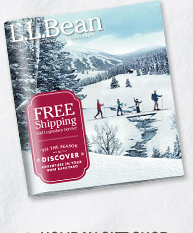 Bean Christmas Catalog. I like ordering from them. Except it’s hard because the clothes are made for cold weather which we don’t get the likes of here. But I like the pictures on the cover. This one has a winter scene with a family cross-country skiing. Jo-Ann Fabric and Crafts flyer. I used to sew and craft all the time. I need to get back to it. Make some new ornaments this year. It’s not like I don’t have the time! This entry was posted in Personal Blog, Uncategorized by T A Munroe. Bookmark the permalink. I was happy to have no political mailers, too!